When you've ridden to the Opening Ceremony in a helicopter with James Bond, watching 500 athletes march into a stadium just can't compare. Queen Elizabeth, who appeared in an amusing short film with actor Daniel Craig during the kickoff to the London Games, wasn't too impressed with Team Great Britain on Friday night. 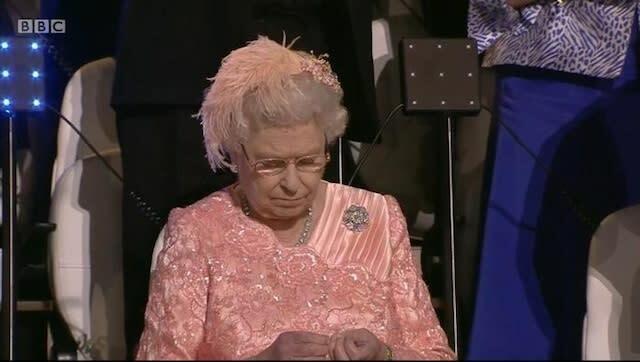 As 80,000 fans roared at the arrival of the nation's athletes into Olympic Stadium, the queen was shown on television intently picking her nails, seemingly oblivious to the pandemonium around her. Earlier in the Ceremony, Queen Elizabeth and James Bond were shown taking a helicopter away from Buckingham Palace. Director Danny Boyle filmed the scene in March and the queen was excellent in her brief role. I'd go so far as to say that she was a better Queen Elizabeth than Helen Mirren. The segment culminated with a live shot of two stuntpeople dressed as the queen and Bond parachuting out of the helicopter into Olympic Stadium. All that adrenaline must have taken its toll on the 86-year-old monarch. Displaying her usual stoicism, the queen couldn't have been less interested in the Great Britain delegation marching in last during the parade of nations. The pool television feed cut to her for three seconds as the team walked on and she was picking her nails for the entirety. The queen not caring about athletes marching? Not surprising. 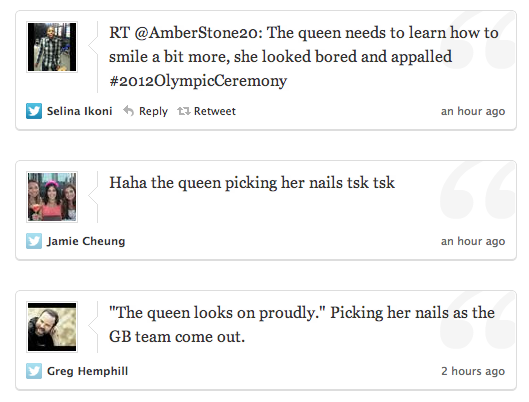 The queen picking her nails in public? That's the stunner here. That's an action not befitting royalty. It's downright plebeian. What was she doing when the camera wasn't on her: Sipping on a Budweiser and burping? If Kate Middleton picked her nails on camera, she'd get the Anne Boleyn treatment!